If you are after a fresh idea for a unique promotional or unusual corporate gift item, you are in right place at right time. 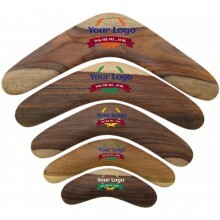 What could be better than self-explaining promotional item such as the boomerang. It speaks for itself - What goes around comes around / Many happy returns / Great things are coming back, etc. 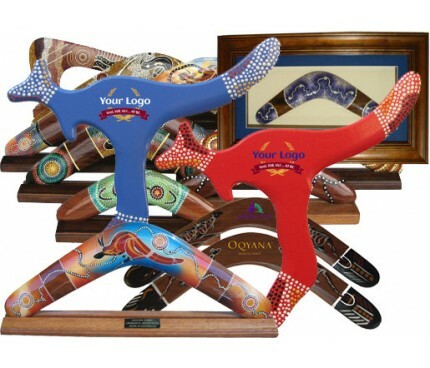 Right here, in front of you is the widest ever range of options and sizes - from low cost promotional returning boomerangs to collectable framed Aboriginal artifacts. 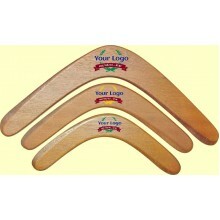 Returning boomerang, 12 inch, blank, or with your artwork / logo printreturning shape, blank, or pri.. Returning boomerang, 14inch / 36cm, blank, or with your artwork / logo printreturning shape, blank, ..
Boomerang unpainted with wings span 18 inch / 47cmReturning boomerang elbow shapePrinting is possibl.. Logo print boomerang, 12 inch, aboriginal hand painting on the wingsreturning shape, hand painted ar.. 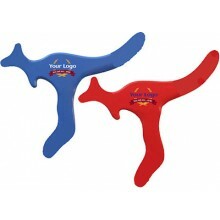 Promotional boomerang, 14inch / 36cm, hand painted wings, logo print in a middleReturning boomerang ..
Boomerang hand painted with wings span 18 inch / 47cm and logo print in central partReturning boomer..
Kangaroo competition boomerang with your logo print - guaranteed to returnCrafted in the shape of Au.. Wooden Boomerang Blank, 6 inch / 15cmSmall souvenir boomerang that could be fully customized accordi.. Wooden Boomerang Blank, 8 inch / 20cmSmall souvenir boomerang that could be fully customized accordi.. Wooden Boomerang Blank, 10 inch / 25cmSmall souvenir boomerang that could be fully customized accord.. Wooden Boomerang Blank, 12 inch / 30cmSmall souvenir boomerang that could be fully customized accord.. Wooden Boomerang Blank, 14 inch / 35cmSmall souvenir boomerang that could be fully customized accord.. 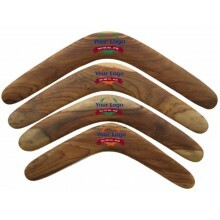 Wooden Boomerang Blank, 16 inch / 40cmSmall souvenir boomerang that could be fully customized accord.. 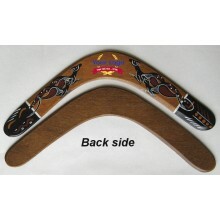 Wooden Boomerang Blank, 18 inch / 45cmSmall souvenir boomerang that could be fully customized accord.. 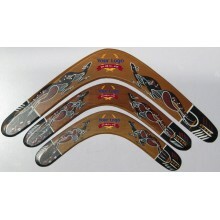 Wooden Boomerang Blank, 20 inch / 50cmSmall souvenir boomerang that could be fully customized accord..